Send A Message To Marc. Session Fees: $100-$150 per session. Please contact me for your specific cost per session. 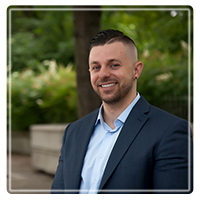 Marc J. Whitehouse is a Registered Social Worker dedicated to supporting you through all types of challenges! Marc's approach to therapy is active and requires a high level of client participation and engagement. He provides a unique approach to therapy that is both highly supportive and tailored to your unique needs. You can expect him to be clear and organized in order to support each goal you want to work on to the fullest! Solution-Focused Brief Therapy (SFBT): SFBT can help you quickly understand a problem and over a few sessions offer a new perspective and a new approach to your problem. Family-Based Therapy (FT): FT works to mend family struggles and create a plan to sustain healthier more supportive relationships and dynamics to improve family functioning on a long-term basis.